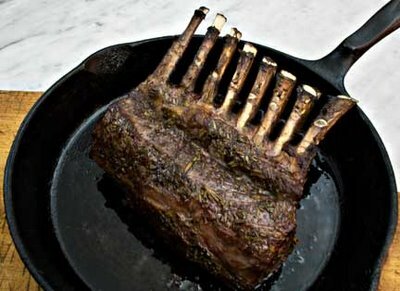 Roast Rack of Lamb with Red Wine Sauce is quick and easy to make, but it’s rich with flavor and perfect for days when you don’t want to fuss with dinner. The lamb is washed, trimmed, put in a simple marinade for 30 minutes, browned on the stove, and oven-roasted. The marinade is boiled and turned into red wine sauce. That’s pretty much it. The sauce’s intense flavor is balanced by the lamb, which cooks to perfection in 15-20 minutes. Oven-roasted potatoes go really well with Roast Rack of Lamb. They’re also easy to make: cut the potatoes in 2” chunks, brown one cut-side of each chunk in a little olive oil using an oven proof skillet, turn each chunk browned-side up, and put the pan of potatoes in the oven with the lamb for about 15 minutes to finish cooking.